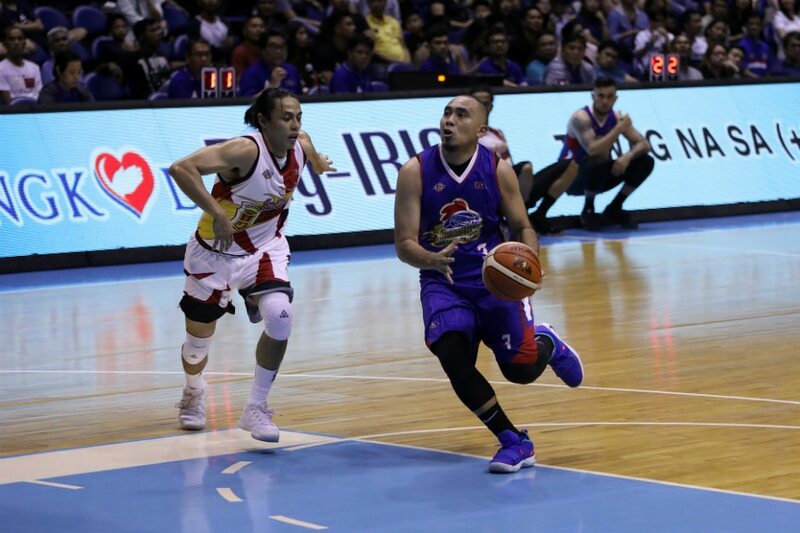 MANILA, Philippines — The Magnolia Hotshots need to play with a sense of urgency after suffering a lopsided loss to San Miguel Beer on Sunday, putting them at 0-2 in the 2019 PBA Philippine Cup. This, according to head coach Chito Victolero after the Hotshots found themselves on the receiving end of a 113-92 shellacking at the hands of the four-time All-Filipino champions. The Hotshots fell behind by 10 points right at the start, but fought back in the second quarter and even trimmed the deficit to six points early in the third frame. But they could get no closer, and ultimately the Beermen broke the game open once more. "Wala talaga eh," Victolero said after the game. "Wala pa talaga kami sa rhythm tsaka timing." Their schedule can be partly blamed for their struggles. Magnolia started the conference late, having played deep into December 2018 as they won the PBA Governors' Cup. Their game against San Miguel was thus only their second game, while the Beermen were already playing in their seventh contest. Victolero thus noted that their opponents have already gained their rhythm, while they are still trying to work their way into form. "But I don't want to make an excuse," he quickly added. Instead, the coach said they will simply find a way to get that rhythm and timing that they need in order to be competitive again. Against the TNT KaTropa last Sunday, it was their offense that failed them. A week later against SMB, their defense fell well short. "We have to find ways to get our rhythm again, to find ways how to get our chemistry again, and to find ways how to compete again," said Victolero. "Siguro, trabaho na naming mga coaches 'yan, kung papanong gawin." "But kailangan siguro, mag-start na kaming ibalik ulit 'yung timing tsaka 'yung rhythm ng team. Kasi 'yun 'yung kulang eh. Hindi kami maka-bwelo ng dire-diretso," he added. Victolero said they are not yet in panic mode, even after falling to 0-2 in a short conference. "But," he said, "right now, we have that sense of urgency na kailangan na naming mag-start mag-laro ng laro namin. Kasi, mahirap malubog." With this in mind, Victolero sees their game against Rain or Shine on Wednesday as a crucial point of their campaign. "That's a big game on Wednesday," he said. "We have to make sure that we're ready on Wednesday." It won't be an easy task. The Elasto Painters are currently the top team in the PBA with a 6-1 win-loss record, and have won four straight games. Moreover, they are brimming with confidence after handing the erstwhile unbeaten Phoenix Fuel Masters their first loss of the conference. "Hopefully, sana maka-compete kami sa Wednesday," said Victolero. "Siguro kailangan ng A-game namin doon, kailangan namin talagang mag-laro ng maayos." "Kapag ganito ang nilaro namin, baka ganito na naman ang resulta." For more sports coverage, visit the ABS-CBN Sports website.